While Sun Peaks is a magical wonderland in the winter, covered with a blanket of powdery snow for fantastic skiing and boarding, come late spring, warmer temperatures unveil new opportunities. For hikers a network of 18 designated trails that range from short, gentle strolls to heart-pounding alpine summit treks await, while mountain bikers can take advantage of and 40 lift-access trails that range from technical single-track to flowing machine-made routes. The natural beauty here is stunning anytime, with the hiking and biking season running between late June and the first week of September, during the peak wildflower season, from mid-July through mid-August, you’ll see the hills blanketed in vibrant yellows, fiery reds and deep purples for an even more unforgettable experience. No matter which routes you plan to take, be sure and bring your camera, smartphone (or GoPro-type device for mountain bikers) as you’ll be able to capture many picture-perfect moments. The Valley Trail Network is a low-grade, lighted trail network with paved and unpaved sections shared by hikers and cross-country bikers. The most popular and easiest of the cross-country trails at Sun Peaks, this is a 6km loop that meanders throughout the village area. It leads from Parking Lot #5 to Burfield Drive, past the entrance to Sun Peaks Resort. Experienced Sun Peaks hikers often note the #10 West Ridge Trail as boasting the very best views in the region, including panoramic vistas of Skunk Peak and the valley below. To reach the trailhead, take the chairlift and then head onto #2 Crystal Bowl Loop before turning on the Top of the World Trail. That route then joins with the #10 West Ridge Trail where you’ll stroll through open meadows (with wildflowers during the season) before enjoying views of the valley below while Skunk Peak towers above to the east. For those looking for a short but sweet hike, the Vista Trail can be found at mid-mountain base after exiting the Sunburst Express. It traverses through mountain meadows and subalpine woods, with the bottom half relatively flat for an easy out-and-back. Or, you can end with a short uphill climb to Sun Peaks chapel to make it a loop. This incredibly scenic hike begins from the mid-station of Mt. Tod. You can reach it by following the Vista Trail first, but rather than following the loop continue for .4km along the West Bowl Trail until it joins the Valley View Trail to the left. It then loops down the mountain, crossing Challenger Meadows where you can take in picturesque views of the village below. Afterward, take the steep but short hike back to the chairlift, or turn right at the Trail to Village sign. Accessed from the Vista Trail, the West Bowl Trail is a scenic path that leads to wildflower-filled alpine meadows and forested sections out to Tod Lake. One of the top trails in Sun Peaks, the Tod Peak trailhead can be accessed via the upper reaches of the West Bowl Trail. It peaks at more than 2,150 metres, passing through many of the environments the South Thompson Shuswap is known for, like vast meadows, freshwater streams and alpine forest. Your reward for this trek can be found at the top: a spectacular 360-degree view of the colourful landscape and towering mountains. Time Required: 30 minutes one-way, 5 hours for the full route from the mid-mountain trailheads. This hike starts with the easy Vista Trail, but rather than following the loop you’ll continue .4km on the West Bowl Trail until it joins with the Crystal Bowl Loop. 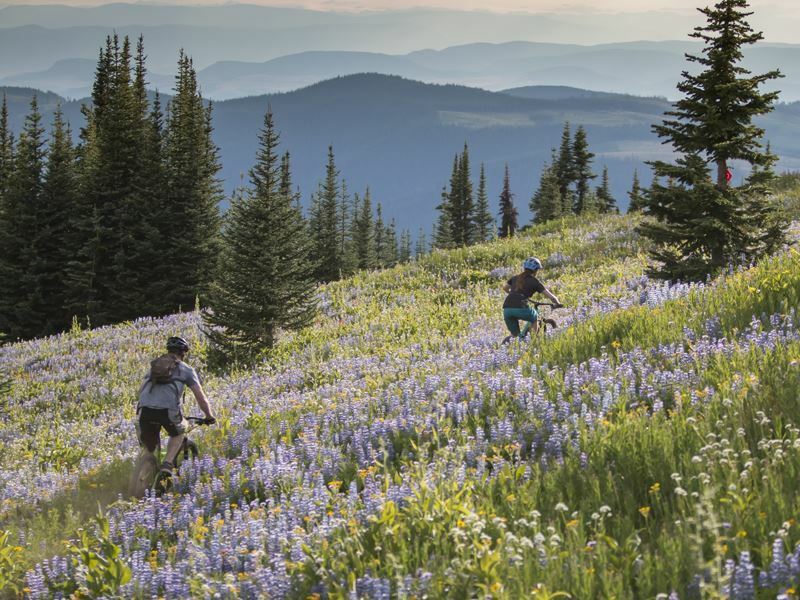 Head to the right where the route climbs across the lower Crystal Bowl through beautiful wildflower meadows that include fireweed paint, tiger lilies and Indian paintbrush during peak blooming season. While Gil’s Trail is popular in the winter for backcountry skiing, it’s considered one of the region’s best-kept secrets for hiking during the warmer months – oftentimes, you won’t see another soul, just magnificent scenery. The shortest route to Tod Lake, it descends Mount Todd, following the steep slopes on the east side of the mountain, dotted with lots of vibrantly-hued alpine flowers during the peak blossoming period. Your reward that comes with hiking the Top of the World Trail is a trek on the iconic Juniper Ridge Loop, considered a must-experience. It traverses a gentle, uphill sloping route through the Headwalls meadows before connecting to Juniper, an easy loop where you can take in some of the most breathtaking sights, and the lovely scents of the wildflowers when they’re in bloom. Altitude is a high alpine cross-country trail with technical rock and root sections along with short, sharp climbs. It starts at the top of the Bike Park and traverses through forests and meadows out to Tod Lake just below the summit of Tod Mountain. From the lake, the trail continues the loop back to the top of the Sunburst trail. If you time it right, you can enjoy an incredible sunset while pedaling across the west bowl of the mountain. One of the top kid-friendly options in the Bike Park, Smooth Smoothie is a wide and gentle top-to-bottom trek that includes switchbacks all the way down the mountain with little table top jumps. The Smooth Smoothie was considered the easiest trail in the park until the New Green Trail came along. The newest in Sun Peaks Bike Park it’s also ideal for beginning downhill riders and kids as well as for cross-country riders who come off the Altitude or Big Rock rides. It finishes at the top of the new Bike Skills Park. This single-track ride is lots of fun – fast, flowing and offering several technical sections for testing your bike handling skills. This cross-country loop trail accessed from Stone’s Throw via the Vista Trailhead is especially scenic and a favourite among mountain bikers. It has a long, low-grade rise out to the lake and a fabulous downhill ride bike. When the trails are wet after heavy rains or in early spring it makes for quite a workout. This lift-access cross-country bike trail is another especially scenic ride. From the top of the Sunburst Express chairlift it travels along the single-track trail through picturesque wildflower-filled meadows and lush forests over to the top of the Sundance chairlift. From there you’ll make the quick downhill ride to McGillivray Lake forest road where you can either venture over to the lake for a swim or continue downhill back to the village. 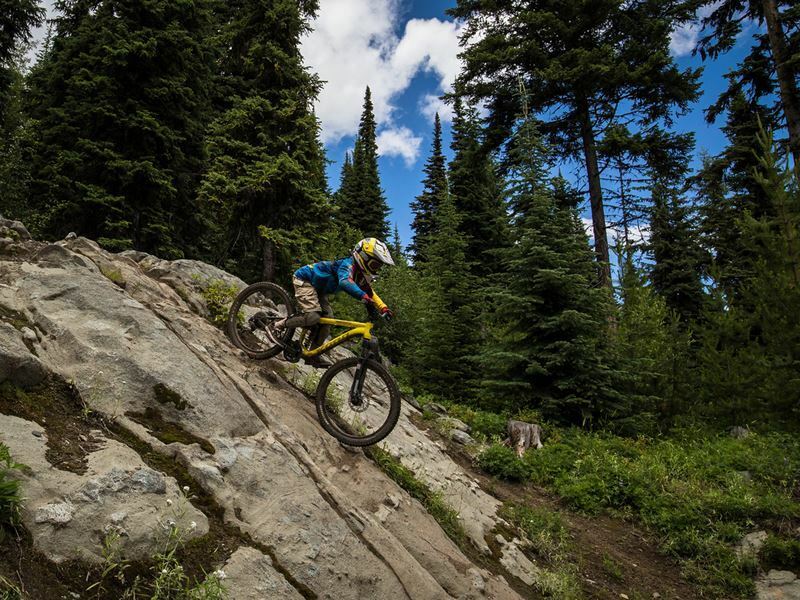 Mountain biking locals and frequent visitors like to link up the trails used by the Canadian Mountain Bike Downhill Championships, hosted at Sun Peaks between 2014 and 2016, including DH, Insanity One, Sticky One and Resurrection. The 1.23km DH trail starts with a full-throttle descent that includes moderate rock drops before becoming single-track, while its final section is made up of fast and flowing berms. Insanity One runs for 1.19km and is considered the mountains most technical trail with very steep, heart-pounding sections, while Sticky One is a .45km steep single-track with flowy corners and technical rock sections. Finally, .73 km Resurrection is a fast rolling, flowing single-track with a moderate grade and a couple of jumps along the way.